Guelph – “That’s a pretty good way to start off a folk festival.” So said Old Man Luedecke after hearing a song by Lowlands, his partners in the “That Lucky Old Sun” workshop on the Lake Stage. Of course the Hillside Festival hasn’t really been a folk festival for some time now, but it has held on to the general folky, hippie-ish vibe and has continued to book folk performers even as some of the festival’s emphasis has shifted towards hot new indie rock acts. The lineup for the festival was generally pretty eclectic, with a focus on the overall vibe rather than booking a lot of big name acts. This makes for a good opportunity to discover some brand new acts. One of the more unique ones I caught was Australia’s Graveyard Train, who augment their country-ish sound with male chorus style group vocals, lyrics about witches, mummies, and monsters and most impressively, a guy playing hammer and chain as a percussion instrument. 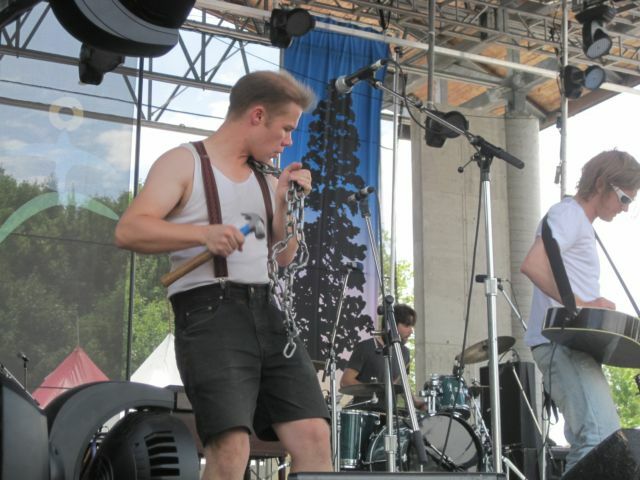 A frickin’ hammer and chain! Amazing. Over the past few years, Hillside has partnered with Pop Montreal, giving them a couple hours time in the schedule to do with as they will. 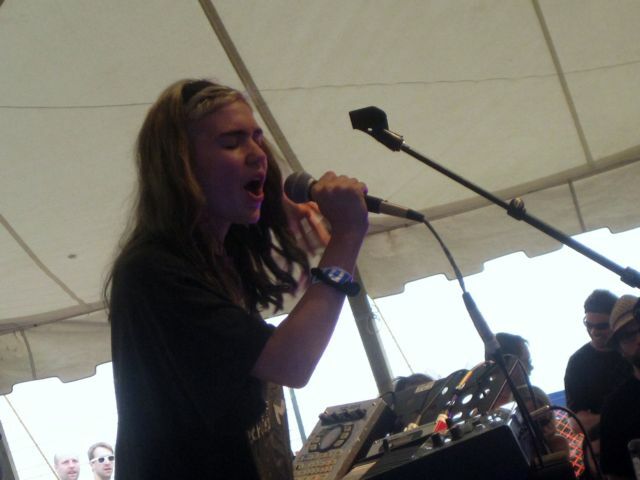 As usual, the Pop Montreal folks did a good job of showing off some up and comers from the Montreal scene, including Grimes, who impressed with her so called “weird pop.” Also impressive were fellow Montrealers Pat Jordache, who played right before Grimes on the Island Stage. 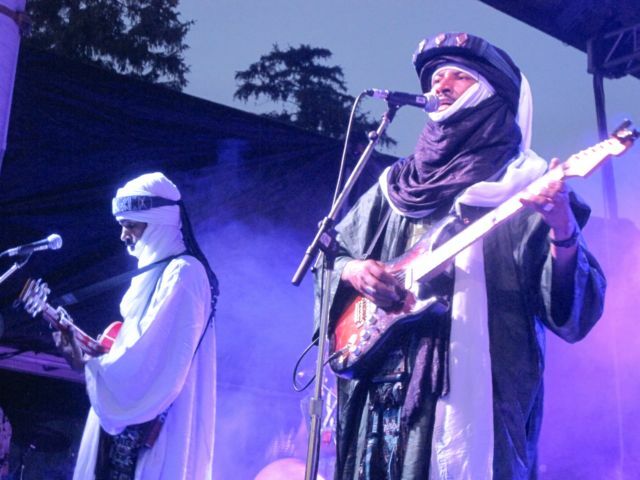 The highlight of their set came early on as they were joined onstage by a member of Niger’s Etran Finatawa, his desert blues guitar leads blending effortlessly with their sound. Everyone onstage seemed to be having a lot of fun jamming together on that one song and I’ve got to admit I was a little diappointed that he didn’t stick around for the whole set. Now Magazine has a video of the song here. Etran Finatawa’s mainstage set on Saturday night was really something to see. Until fairly recently, I was largely unfamiliar with their style of music, but after seeing them at Hillside, I would consider myself a fan. They were definitely one of the highlights of the festival. Another highlight was Lost In The Trees. Songwriter and composer Ari Picker has crafted a collection of beautiful, lush, epic sounding songs that were expertly executed by his bandmates on a variety of instruments including cello, violin, accordion, and tuba. 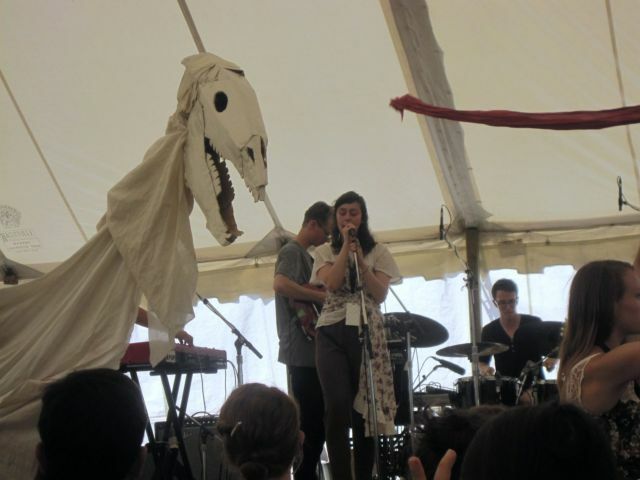 They further demonstrated their instrumental prowess in a Sunday afternoon workshop with Braids, meshing their orchestral folk sound with the Montreal band’s art rock. It was one of those unique Hillside moments that you won’t see anywhere else. While a lot of fairly big names like Sloan, Kevin Drew, and The Rural Alberta Advantage played this weekend, perhaps the most enthusiastic reaction of the weekend was directed towards an unlikely performer – Fred Penner. That’s right, the children’s performer was playing before a devoted crowd largely made up of adults and it was kind of the closest thing I saw to a rock star experience all weekend. “Hi kids,” said Penner as he took the stage, “You got older.” It was a bit of a weird scene, but in a way it makes sense – kids who grew up watching Penner on TV, going to his concerts and listening to his albums are looking back with nostalgia and kind of reliving their childhoods. Heck, even those who didn’t grow up watching Penner were enthusiastically singing along. He had the crowd eating out of the palm of his hand and for a brief time a beer tent was somehow transformed into Fred Penner’s Place.